"Without consciousness, there is no choice." Gretchen Steidle's inspiration for her work with women in developing countries first stirred in her as a child when her military family was transferred to the Philippines where she discovered the difficulties of poverty. She graduated in 1996 with a BA in foreign affairs from the University of Virginia, where she attended as a Jefferson Scholar. 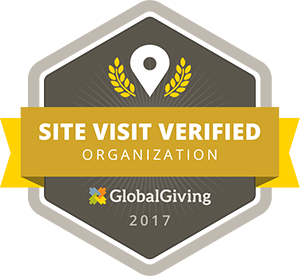 From 1996-1999 Gretchen worked in international project finance for PMD International, Inc., a boutique investment banking firm specializing in infrastructure development in poor countries. She returned for her MBA (2001) at the Tuck School at Dartmouth College, where she helped to found what is now Tuck's Center for Business and Society. After Tuck, she joined Ashoka: Innovators for the Public, an international non-profit organization advancing the profession of social entrepreneurship. Gretchen was responsible for leading the launch of an incubator for social entrepreneurs and was invited to direct Ashoka's sister organization, Youth Venture. 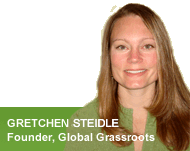 In 2004, Gretchen established and now leads Global Grassroots. Gretchen is a producer of the three-time Emmy-nominated documentary film, The Devil Came on Horseback, about her brother's tenure as a military observer in Darfur, Sudan, which premiered at the Sundance Film Festival in 2007. She is also co-author of her brother's memoir, titled The Devil Came on Horseback: Bearing Witness to the Genocide in Darfur, published by PublicAffairs in 2007. That same year, Gretchen was honored by World Business Magazine and Shell as one of the top International 35 Women Under 35. In 2010 she was honored as a CNN Hero in Haiti for her work providing support for survivors of the earthquake, and was also recently nominated for a national CNN Hero Award. In the same year she was awarded the inaugural Susan J. Herman Award for Leadership in Holocaust and Genocide Awareness by the Cohen Center for Holocaust and Genocide Studies at Keene State College. In 2011 she was chosen one of seven Remarkable Women of the World by New Hampshire Magazine. Gretchen is a certified practitioner of the alternative healing modality Integrative Breathwork and is trained in Coherent Breathwork, which she utilizes in her work in Haiti, Rwanda, and Uganda to help women and children heal trauma from war, disaster, and sexual violence. She regularly conducts workshops on Conscious Social Change at leading wellness institutions, including Kripalu and the Omega Institute, has brought her work to universities including Dartmouth College and the University of Virginia as an accredited semester-length graduate and undergraduate course, and speaks nationally on leadership, mindfulness, and social entrepreneurship in post-war Africa. Her newest book, Leading from Within: Conscious Social Change and Mindfulness for Social Innovation was published in 2017 by MIT Press. "I've always believed in inner-driven change — that decisions made with the greatest level of awareness will ensure the wisest response and most potent, effective results. I've now spent more than a decade training in the fields of personal transformation, meditation, and alternative healing. 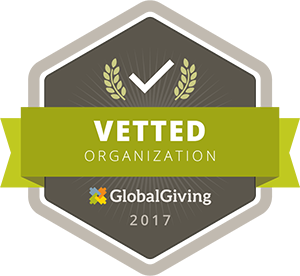 Bringing my passions together, I founded Global Grassroots in 2004 to advance what I call Conscious Social Change among grassroots, marginalized women."